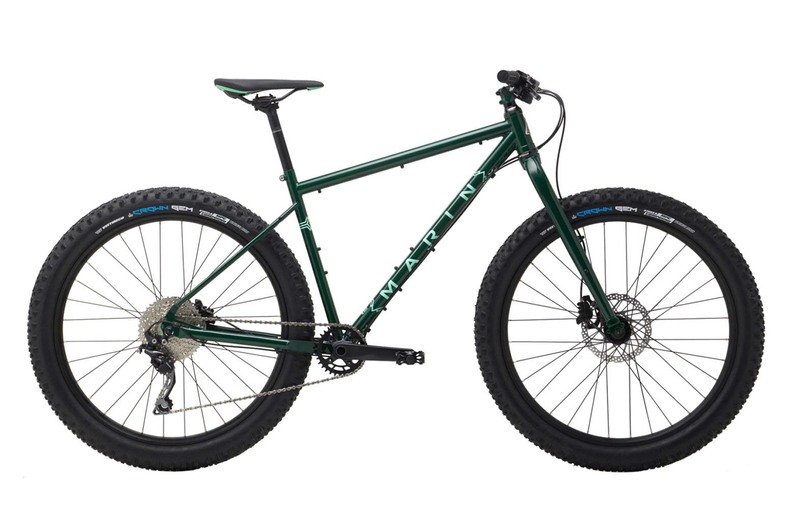 The Pine Mountain is taking hardtail adventure and trail riding to the next level featureing a classic steel frame and large volume 27.5+ tires. The wider plus-sized tires provide increased traction and control because they produce a larger contact patch with the ground than a traditional-sized tire. The enlarged tire also has an outer circumference that is almost the same as a standard 29” tire, which means they both share similar roll-over characteristics. With 27.5+, you received unparalleled traction and exceptional roll-over. The Pine Mountain features trail ready geometry and a wide-range 1x drivetrain making it worthy of any epic trail adventure. It’s time to get out and explore with the Marin Pine Mountain. The Pine Mountain is an incredible bike coming in at a great price. Oversized 27.5”+ tires provide a supple and smooth ride, the Shimano 1x10 drivetrain provides all the gears you need to make it up the steepest climbs, and Shimano hydraulic disc brakes provide incredible stopping power when descending those steep chutes. The bike is rounded out with Marin Tubeless Ready wheels for less flats and incredible traction. If you are looking for a bike that can handle everything the trail has to offer, the Marin Pine Mountain needs to be your next ride. From fast flowy single track to all day bike-packing adventures and everything in between, the Pine Mountain was designed to handle it all. Push your riding further and explore with more confidence than ever before. Bike Magazine - " Marin’s Pine Mountain is one such plus-size trail stomper. Those big tires add cushion and give you more traction, which means less falling. The Pine Mountain’s steel frame and fork are paired with a 10-speed Shimano Deore drivetrain and Shimano BL-425 hydraulic disc brakes for unwavering reliability." VeloAcier.com - " The PINE MOUNTAIN family is definitely oriented and designed for adventure, and is perfectly suited to long treks over several days."